Olympus pro kit is available in Amazon.com via Olympus itself. The pro kit includes Olympus OMD E-M5 Mark II camera with M.12-40mm f2.8PRO lens, M.40-150mm f2.8 PRO lens, M.7-14mm f2.8 lens and the package also includes CBG-10 System bag, BLN-1 battery, and HLD-8 grip. If you order them separately you will have to pay approx – $5123, but if order altogether (PRO Kit) via Olympus you have to pay $4,018.48. That’s you save $1195. 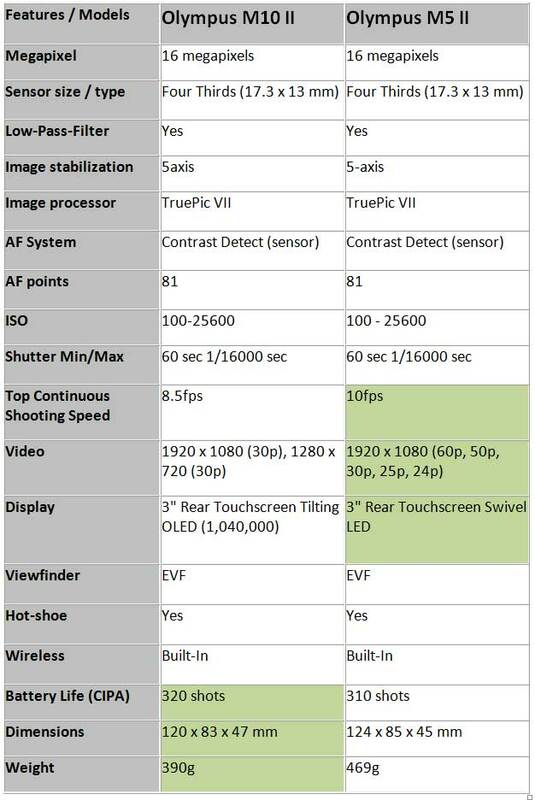 Olympus OM-D E-M10 II vs. Olympus OM-D E-M5 II Specification Comparison Table. Both camera have almost same core specification, the sensor, that clearly means you will get same image quality from from both the camera. Both camera have ultra-sensitive 5-axis VCM (voice coil motor) 5 axis image stabilization system, the advance 5-axis image stabilization system assisted with updated gyro sensors and it allows you to have full 5 exposure steps of compensation. No high resolution mode available in E-M10 II camera but Olympus E-M5 II camera we can capture 8 images in a sequence to create a 40MP high resolution composite image. When we discuss which camera will be better to freeze the action of the fast moving subject confidently then Olympus OM-D E-M5 II is the right answer because the camera trades the 10fps of shooting speed but the compact camera OM-D E-M10 II has manages only 8.5fps. 10 more shots you can take by using E-M5 II cameras whereas 310 shots only be taken by E-M10 II. Soon Olympus to announce the following products. A6000 is one of the best camera I have ever used, the camera is a excellent balance of features and price, the A6000 features 24 Megapixel Hybrid APS-C Sensor, the Fast Hybrid AF & 179 Phase-Detect Points works even when you are using 11fps of continuous shooting mode. The camera offers Full HD 1080i/p video recording is supported at both 60 and 24 fps frame rates to produce high resolution movies with a smooth, cinematic look. Built-in Wi-Fi connectivity enables the a6000 to instantly share imagery to mobile devices for direct sharing online to social networking, via email, and to cloud storage sites. NFC (Near Field Communication) is also supported, which allows for one-touch connection between the camera and compatible mobile devices; no complex set-up is required. The Sony A7S camera features ultra high sensitive 12MP Fullframe sensor enables you to capture subjects in extreme low-light condition, the camera ISO range can be boosted up to 409600 in still and video mode both, the camera uses electronic and mechanical shutter (both) and give you a shutter range of 30 – 1/8000, the camera can capture up to 5 fps at 12.2 MP for up to 200 frames. The a7S is able to output uncompressed UHD 4K (3840 x 2160) at a 4:2:2 color depth over HDMI to compatible third party recorders, you can also record super slow motion movies, 120 fps is possible at 720p using an approximately APS-C sized center crop of the sensor. 120 fps recording allows for about 5x slow motion when played back in 24p. Built-in Wi-Fi connectivity enables the a7S help you to share your images and use your camera from a distance with the help of your smart device. 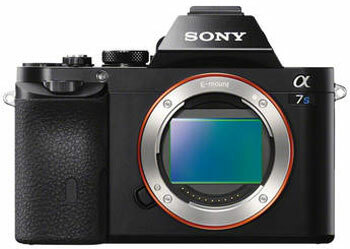 Buy Sony A7S from Amazon and Adorama. 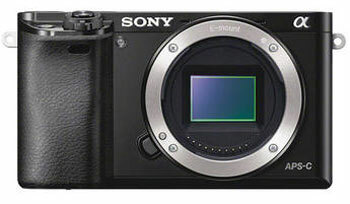 #3 High End APS-C camera with 28 MP sensor, 414 AF points and 4K recording, but limited lenses. 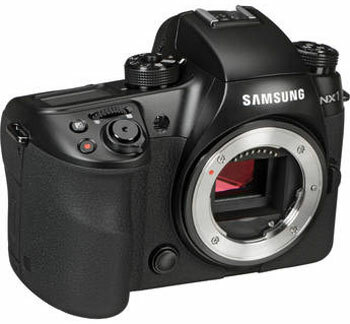 The Samsung NX1 is one of the most advance mirrorless APS-C camera the world have ever seen, the camera features a massive resolution of 28 Megapixel by maintaining good shadow details and enhancing low-light performance throughout the camera’s 100 to 51,200 ISO range. The most advance part of this camera is the Hybrid Autofocus system that utilizes 205 phase and 209 contrast-detection autofocus points to acquire focus quickly and precisely. The Camera can capture 15 frames per second @ 28 MP by maintaining the Auto Focus. The shutter speed can be bossted upto 1/8000. The Samsung NX1 allows you to capture 4K Recording at 24 fps, UHD Recording at 30 fps and 1080p Full HD Recording at up to 60 fps. The camera features advance sharing controls, WiFi and NFC allows you to easily share your files to other remote devices and you can also control your camera with the help of Android or Apple smartphone. Olympus E-M5 Mark II uses a 16-megapixel High-Speed Live MOS Sensor and Olympus’ TruePic VII image-processing engine, camera’s sensor allows for a maximum ISO of 25,600. The other most important feature is the 40MP High Res Shot can be generated via this camera with the help of newly implemented sensor shift image capature technology, but keep in mind that the camera need tripod while taking 40MP Stills. The camera features contrast detect system, so contrast based system is active either you are shooting still images or recording videos. The other most important feature 5-axis image stabilization, the ultra-sensitive 5-axis VCM (voice coil motor) employs updated gyro sensors for a full 5 exposure steps of compensation. Other features include interactive, high-resolution and high-magnification electronic viewfinder. 3″ touch-screen LCD monitor, with variable angle positioning. Built-in Wi-Fi for instant connectivity. The good: Best M4/3 camera till date for still shooters. 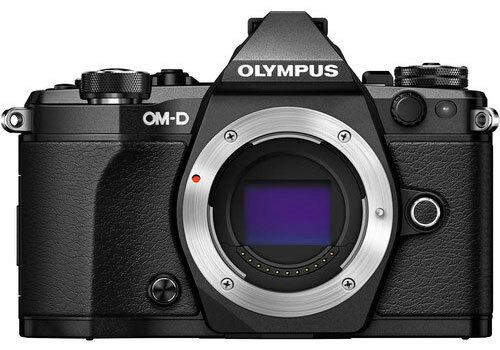 Olympus Finally announced the OM-D E-M5 II camera, the camera features redesigned 16MP Four Thirds sensor of E-M5 camera and advance 5-axis image stabilization. The Olympus E-M5 new features include 40MP image capture, the camera uses sensor shift technology and captures 8 images step b step to generate a large 40MP images, other specification include 10 Frames Per Second continues shooting speed and on the rear side we have articulating 3″ 1.04 million dot touchscreen LCD along with a 2360k-Dot Electronic Viewfinder, the built-in WiFi let you share you images without any physical pain. The camera comes with with a dust- and splashproof FL-LM3 flash. 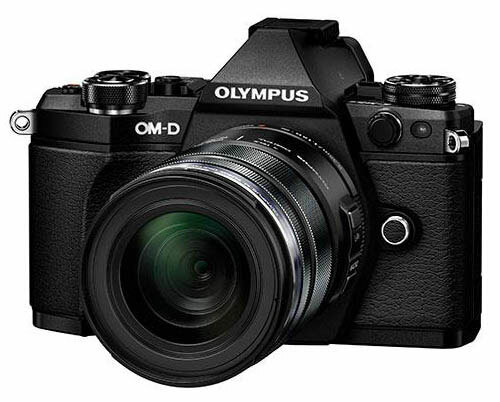 The Olympus OM-D E-M5 II will be available this month for $1099.99 body-only. Olympus Imaging Corporation (President: Haruo Ogawa) is pleased to announce the Olympus OM-D E-M5 Mark II, scheduled to go on sale on end of February, 2015. This Compact System Camera conforms to the Micro Four Thirds System standard, and is equipped with a 5-axis image stabilization that boasts compensation performance equivalent to 5 shutter speed steps*1. The OM-D E-M5 Mark II is the successor model to the OM-D E-M5 which packs excellent SLR image quality and shooting style, and the world’s first*2 5-axis image stabilization into a compact and lightweight body, exploring the new world of Compact System Cameras as the model that enables users to fully immerse themselves in shooting without taking their eye away from the viewfinder. The advanced, powerful, in-body image stabilization system achieving compensation performance of 5 shutter speed steps, and the dustproof and splashproof, compact, lightweight body, and lens systems providing excellent mobility, both ensure the top-class image quality for still images and movies in any environment taken hand-held with interchangeable lens camera. The powerful 5-axis VCM image stabilization is even more advanced than ever before. The E-M5 Mark II provides the most powerful compensation performance, equivalent to 5 shutter speed steps*1. Users can enjoy hand-held shooting without worrying about camera shake in low light places or during telephoto photography. It powerfully compensates for camera roll, which cannot be corrected with in-lens stabilization, and helps users capture blur-free photos even with dim-light and slow shutter speeds. It also provides the most powerful horizontal/vertical shift compensation, assuring stable hand-held macro shooting. This feature also prevents image shake in the viewfinder for stable framing, no matter what lenses you use. The Zuiko lens produced by Olympus optical technology, the 16M Live MOS sensor bringing out the best in Zuiko image performance and providing rich tonal reproductions as well as high-sensitivity performance, the TruePic VII image processor drawing out the full power of the lens and sensor, and the in-body image stabilization mechanism effective for all lenses. A fusion of traditional optical technology and advanced image processing technology, coupled with the excellent image stabilization produces top-class OM-D image quality among interchangeable lens cameras. Body colors are available in a luxurious black with texture casting, and a bright, gorgeous silver. High-precision, high-quality textures are applied with machined metal dials, knurling, spin patterns, and diamond cutting. The viewfinder, an important design point for the OM-series, features a delta shape for a more bold housing. By lowering the center of gravity in the body (top part of the camera shape as seen from the front), a sense of power and stability are lent to the design, maximizing its presence as an authentic camera. An unconstrained and powerful form evokes a design with distinct presence. Excellent controls and performance have been packed into a compact body. The shape and materials chosen to keep the body easy to grip, solid grip, easy to press customizable 6 Fn buttons, large, easy to rotate dials, and levers placed in a layout that is easy to operate while looking through the viewfinder. This model is also equipped with a vari-angle LCD screen, making it possible to shoot in a variety of situations, including low angle shots taken while holding the camera vertically. Even with the vari-angle LCD, this model has the same compact, lightweight body as the OM-D E-M5. In addition to top-class splashproof performance among interchangeable lens cameras that makes shooting possible even in the rain, this model is freezeproof up to -10°C. These features make it possible to focus on shooting even under difficult conditions with minimum equipment. The new M.Zuiko Digital ED 14-150mm f4.0-5.6 II has been added to the lineup of dustproof and splashproof, high image quality, compact lens system (refer to the separate news release for details). There is also the M.Zuiko Digital ED 12-50mm f3.5-6.3 EZ, an electronic standard zoom lens perfect for movie recording, the M.Zuiko Digital ED 12-40mm f2.8 PRO, a fast, high-performance standard zoom lens, the M.Zuiko Digital ED 60mm f2.8 Macro, perfect for nature macro photography, and the M.Zuiko Digital ED 40-150mm f2.8 PRO, a fast, high-performance telephoto zoom lens. These 5 dustproof and splashproof lenses cover a wide variety of scenes, expanding the boundaries of photography. OM-D Movie is a movie solution that provides cinema-quality movies in hand-held shooting. The powerful in-body 5-axis image stabilization system and compact, lightweight body and lens system provides stable movie recording even without a tripod, more dramatic scene recording with active camerawork, and the possibility of capturing natural expressions without intimidating subjects. This model supports a 60p high frame rate and a 50Mbps high bit rate*4. Control for movie AF and AE has been reworked for smooth, high-resolution, Full HD movie quality. 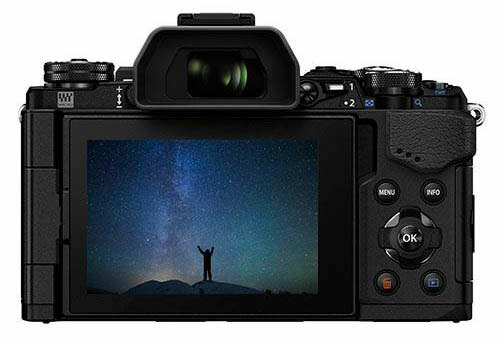 To compensate for image instability, the OM-D E-M5 Mark II in-body 5-axis image stabilization system uses a VCM driver, which floats the image sensor with magnetic force. This construction makes it possible to shoot smooth, hand-held movies without a movie tripod, mini-jib, rails, or other specialized equipment. The image quality resolution and smoothness, AF performance, AE performance, and image stabilization performance are all at top-class level among interchangeable lens cameras. Equipped with Multi Frame Rate, High Bit Rate, ALL-Intra shooting, and able to set time codes, professional level movie editing is possible. The Live View screen can be displayed on an external monitor via the HDMI output, making it possible to check images on a large monitor while shooting. Focus Peaking is now available in 4 colors (black, white, red and yellow), and the intensity can be selected from low, normal and high, making focusing easier when shooting. Settings such as exposure compensation, aperture, shutter speed, and microphone sensitivity can also be changed using touch operations while recording a movie. Audio can also be recorded using an Olympus IC recorder equipped with linear PCM recording connected to the microphone jack for optimal audio levels and high quality audio recording. Because power supply settings to the external microphone can be turned on and off, users can use a high-end condenser microphone or dynamic microphone with a power supply. Camera grip HLD-8G (sold separately) with a headphone jack can be used to listen to recorded audio while shooting. This expandability supports a variety of shooting situations for professional level movies making. You can use the new Clips function to easily create movies with a variety of scene changes. Simply press the movie button once as if taking a snapshot to capture short movies at the preset time*5. Movies shot as Clips are automatically saved to My Clips*6. Users can add effects and background music*7 using the camera and export as a movie file to create a single movie*8. Artistic movies for showing to others can easily be created without editing on the computer. All Art Filters are available when shooting movies. Partial Color lets you capture movies like a scene from a film, and Vintage movie lets you produce an emotional atmosphere in movies without editing. Four different Art Effects, including Art Fade, which makes changes in Art Filter movies more interesting, and Old Film, which gives movies a film-like effect, expand the possibilities of movie expression. 8 images are captured with 16-megapixel image information while moving the sensor by 0.5 pixel steps between each shot. The data from the 8 shots are then combined to produce a single, super-high resolution image, equivalent to the one captured with a 40-megapixel image sensor. This feature is perfect for capturing fine arts and landscapes, and other scenes where high-resolution photos are required. It maximizes the resolution of Zuiko PRO and Premium lenses, making image quality possible that surpasses that of full-frame DSLR cameras. This large, bright, easy to use viewfinder has a field of view of approximately 100%, and a viewfinder magnification of 1.48x. Equipped with Adaptive Brightness Technology which automatically adjusts the backlight brightness in accordance with environmental lighting, the new LV Boost II*9 convenient for shooting stars, and Creative Control for complete freedom of control over color, tone, focus, and aspect ratio, comfortable shooting using viewfinder is possible. RAW sequential shooting is now possible at 5 fps (Sequential L) until the card is full*10. Number of frames will not drop and shooting no longer stops due to sequential shooting time. Additionally, C-AF tracking sequential shooting performance is improved to 5 fps. When using Group Target AF, tracking sequential shooting is possible with the focus on a moving subject within a field of view. This model is equipped with a high-speed 1/8000 sec shutter usually only included on high-end interchangeable lens cameras. It achieves the shortest release time lag of 0.044 seconds among same-class cameras with mechanical shutters. Anti-Shock mode (electronic first curtain shutter*11) that reduces shutter shock is now compatible with sequential shooting, and Silent mode*12 (electronic shutter) for shooting in environments in which silence is required is included. All these allow users to use high-performance shutter according to the type of scene. Smartphone connection and image sharing is now easier with built-in Wi-Fi. Simply scan a QR code to complete initial connection settings. Users can then transfer images, add geotags, and apply Art Filters. A smartphone can also be used to remotely control the camera for wireless shooting in a variety of scenes. 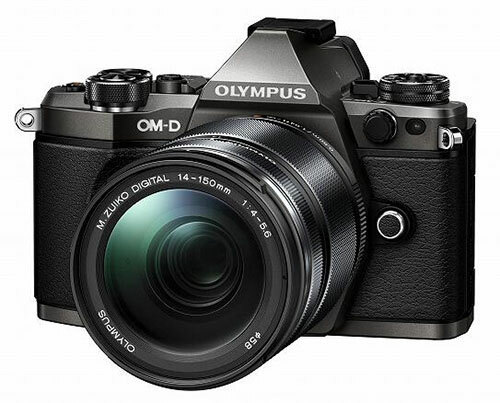 This model is equipped with a variety of functions also available on the flagship model, the OM-D E-M1 v2.0. These include such functions as keystone compensation for trapezoidal correction in Live View, Olympus Capture for controlling the camera from a computer, Live Composite for shooting star trails while checking the results in Live View.